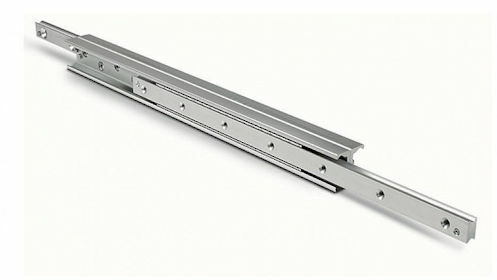 The DE Series is a high capacity telescopic rail assembly where the stroke is approximately equal to the overall length of the rail. This series is constructed with cold drawn steel rails that are hardened to provide long life even in equipment with highly repetitive motion. The bearing system consists of large diameter, caged balls. The large balls and hardened steel raceways yield high load capacities and life. There are three versions available: DEF, DEV, and DEM. The DEF version that is most commonly sold has threaded holes in both rails for attachment. DEV has counter-sunk holes. The DEM has both variants (or mixed) holes.